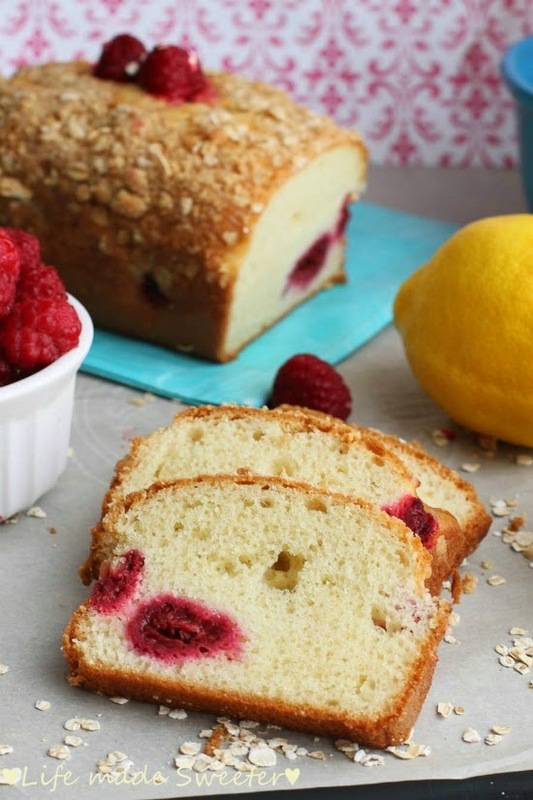 Raspberry Lemon Loaf Cake with an oat topping and lemon glaze – a tangy and sweet combination to create a delightfully refreshing cake. Spring finally arrived last week for us. It was lovely since we still had out-of-town guests stopping by to visit which meant they didn’t have to make the long drive up in the snow. The warm and bright sunshine was such a nice change from the cold and gloomy weather we’ve been getting all winter. I’ve been baking up treats that remind me of spring and summer for a few weeks now. 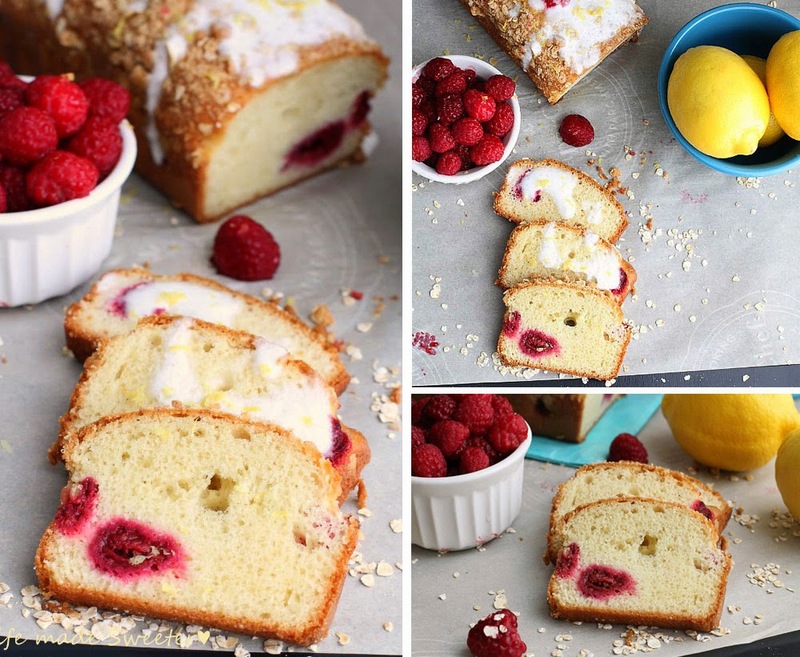 This Raspberry Lemon Loaf Cake is studded with plump raspberries and bursting with a bright lemony flavor which will surely get you in the mood for some warmer weather. It is easy to whip up with no mixer needed and is sure to be a hit anytime of the year for breakfast, dessert or an afternoon treat. 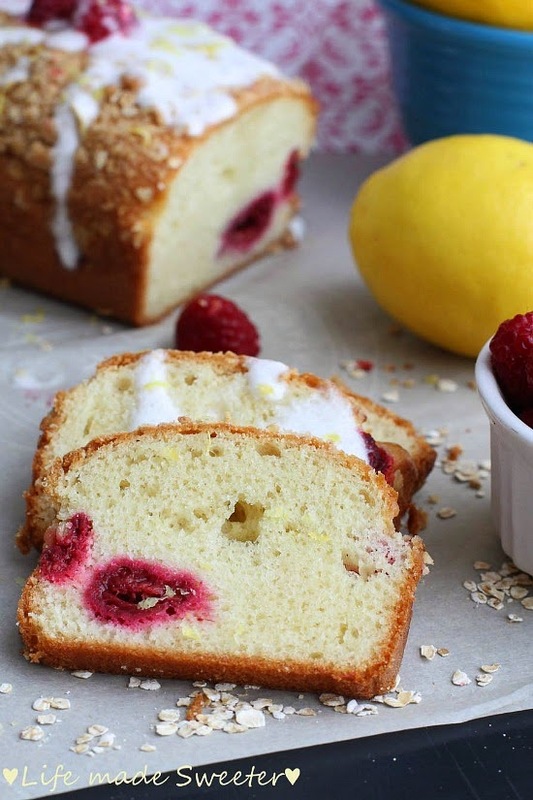 It’s refreshing burst of flavors comes from the lemon zest and lemon juice and is light and moist from the Greek yogurt and melted coconut oil. 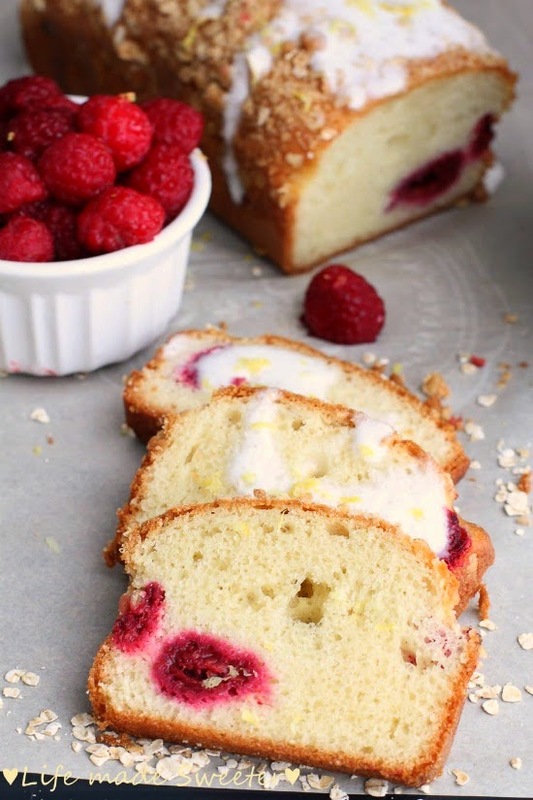 The cake is delicious on its own but topped with a crunchy oat crust and lemon glaze makes this the ultimate melt in your mouth treat. One slice of this cake will have you totally on board to enjoy spring – even if the weather outside doesn’t agree. 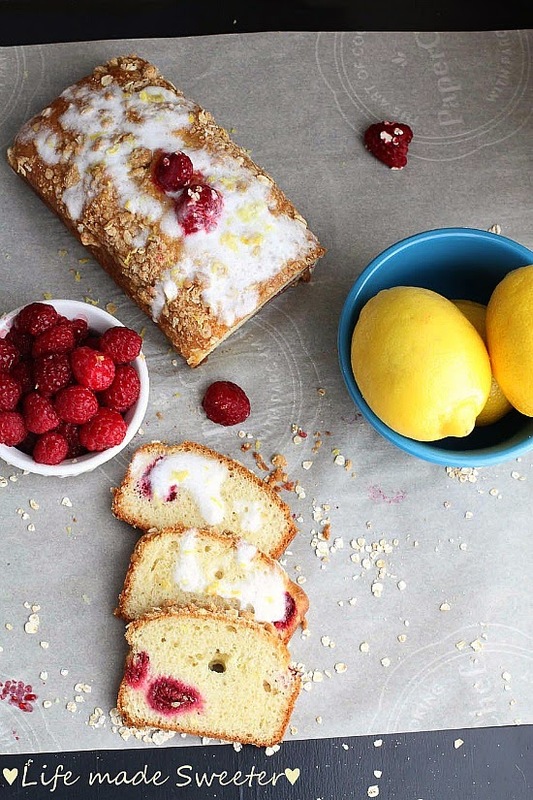 Raspberry Lemon Loaf Cake with an oat topping and lemon glaze has a tangy and sweet combination to create a delightfully refreshing cake. Preheat oven to 350°F. Grease and line the bottom of a 9x5 inch loaf with parchment paper. In a small bowl, mix together the flour, oats, and brown sugar. Crumble in the butter with your fingers combining with the flour until pea-sized lumps are left. Set aside in the fridge. In another bowl, whisk the sugar and lemon zest. Mix in eggs, lemon juice, lemon zest and vanilla extract together. Add the melted butter, coconut oil and Greek yogurt whisking until fully incorporated. Slowly add the flour mixture to the batter in three additions, whisking gently after each addition until flour is just combined. Pour batter into prepared loaf pan. Evenly sprinkle with oat topping. Bake in preheated oven for 15 minutes before turning down the heat to 325°F. Continue baking for 30-35 more minutes, or until tops are a golden brown color and a toothpick comes out clean. Allow cake to cool completely on wire rack. Whisk together powdered sugar and 1/2 of the lemon juice. Add more juice slowly as needed since you want it on the thick side. Pour over top of cooled cake.